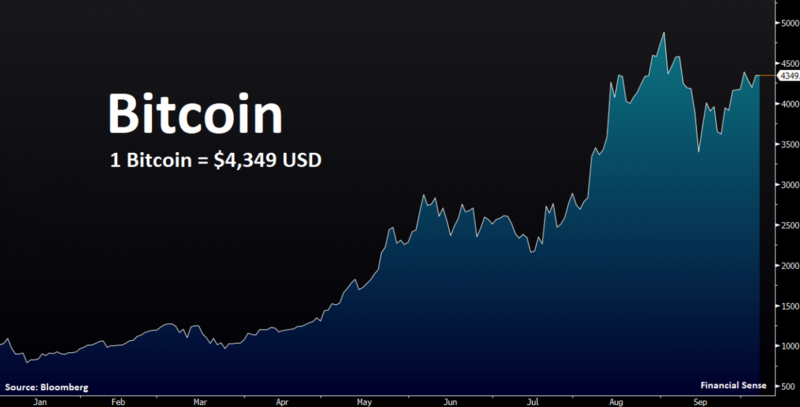 Bitcoin had another giddy plunge in mid-September. The cause, this time, was again Chinese regulators, who first banned the “initial coin offerings” that have produced a new flood of digital currencies, and then began shutting down the exchanges where bitcoin and other digital currencies are bought and sold. The fear was that if bitcoin trading in China stopped, a pillar of demand and liquidity would be removed from the market, and bitcoin would collapse. As it happened, the losses were rapidly recouped, and bitcoin is once again moving towards its previous high of $5000. Bitcoin enthusiast, former Libertarian presidential candidate, and all-around madman John McAfee said simply, “How do you stop something that can’t be stopped?” Indeed, many observers see China’s draconian action as a test case — if bitcoin trading survives in China, it will demonstrate that the currency is effectively ineradicable. Governments won’t be able to stop it; they’ll simply have to come to peace with it and do their best to regulate it. While some bitcoin trading will certainly occur beyond their knowledge, a great deal of it will eventually be conducted on legitimate, above-board, regulated exchanges. Most importantly, as far the government is concerned, taxes will be paid. Bitcoin may yet succumb to some other digital currency with technical superiority; for now, nothing has been able to challenge its dominance. In the wake of China’s actions, trading rapidly shifted to Japan and South Korea. If Chinese miners are shut down, network power will simply migrate elsewhere, and miners in other parts of the world will rejoice for a little while. Thus far, the network is proving very resilient — which is, of course, what it was designed for. Investment implications: Bitcoin is a rational speculation for those with high risk tolerance. The risk of total loss is real; the risk of gains is also very real. We do not recommend digital currency speculation to anyone who is not comfortable with the risk of total loss of capital. We recommend that those who wish to speculate in bitcoin do so only on recognized, regulated exchanges in the United States. With the CBOE planning to launch bitcoin futures trading, some impediments that stood in the way of bitcoin ETFs may be removed. The arrival of bitcoin exchange-traded products could result in a massive movement of funds into the cryptocurrency, and this is a development that speculators should watch closely.